Hello! 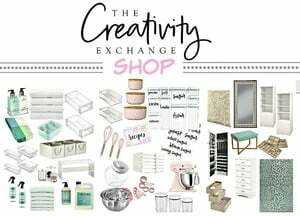 Claire here from Claire Brody Designs! I am excited to share another paint project with you guys this month. I’m sharing my tips today for how to paint laminate furniture. When it comes to furniture thrifting, there are a few things I always consider when making a purchase. Is the piece made of real wood? The first two considerations are deal breakers. If the piece is not sturdy or unique, there isn’t much I can do to give it life. And while I’d love for every piece that I purchase to be made of solid wood, that just isn’t the case a lot of the time. Painting solid wood makes for a much easier paint project, but sometimes I find a piece that is unique and in great shape and I just can’t say no especially when the price is right. 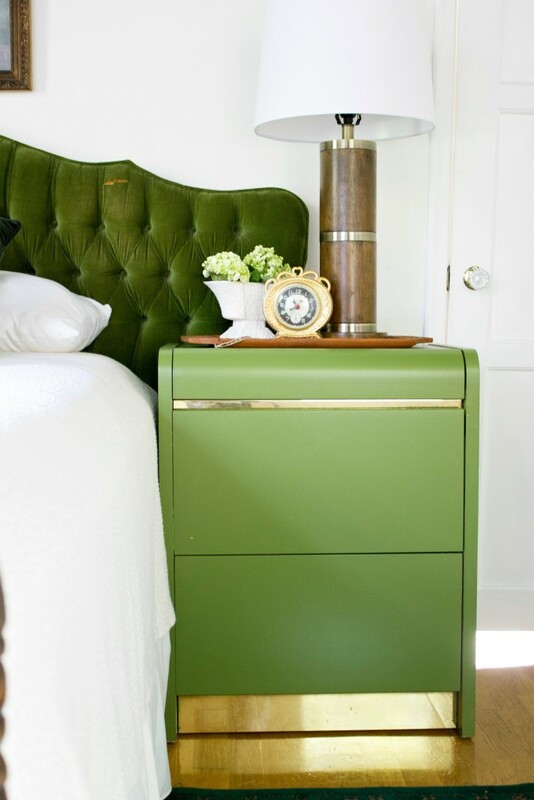 I recently gave our guest room a makeover and found this piece that I knew would be a perfect nightstand. Sturdy? Check. Unique? Check plus… Solid wood? Negative. The inside is made of wood, but the outside has a laminate finish, which is very common to see in old pieces. I knew I wanted to add a bold dose of color to this piece, so I had to tackle the setback of painting over laminate. My piece didn’t have any knicks, so I started with sanding. If the piece has holes that need to be filled, it’s important that happens first. Laminate is a shiny finish that makes it durable and scratch resistant. Sounds like a good thing, right? Not when painting. I used 150 grit sandpaper to give the piece some texture. You don’t want to take the entire finish off – just make it a little scratchy. This gives the primer and paint something to adhere to and will keep it from peeling off. After the piece was sanded, I wiped it down with a wet cloth. If there’s any dust at all left on the piece, the primer and paint will not stick. After I removed all dust, I wiped it down again with a dry cloth. Now it’s time to prime. I used Sherwin Williams multi-purpose latex primer in aerosol form. I had never used a spray paint primer, and the process went very smooth for me. When it comes to paint and most DIY projects, what keeps me from completing most of them is my patience. I just don’t have it. This spray paint primer made the process much more do-able for me. If you do prefer a liquid paint primer, it of course comes in traditional form as well. I gave the piece two coats of primer (with an hour of dry time in between coats). After sanding, give the piece a light sanding and wipe down any dust. 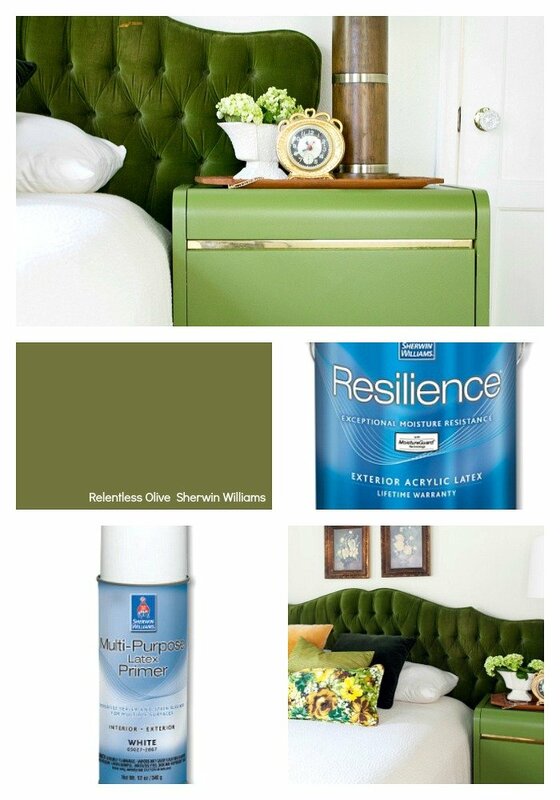 My paint color is Sherwin Williams Relentless Olive. I read online that the best paint to use is their Pro Classic, however, it is not available in dark colors. Because Relentless Olive has dark tones, I wasn’t able to use Pro Classic. I asked the guy helping me what I should use since Pro Classic wasn’t an option and he suggested Resilience, which is their exterior acrylic latex paint. He said it was a very durable paint and would get the job done. Another first for me: I used a roller instead of a brush to paint. I always have a hard time with brush marks when I paint, so I wanted to experiment with a roller this time. 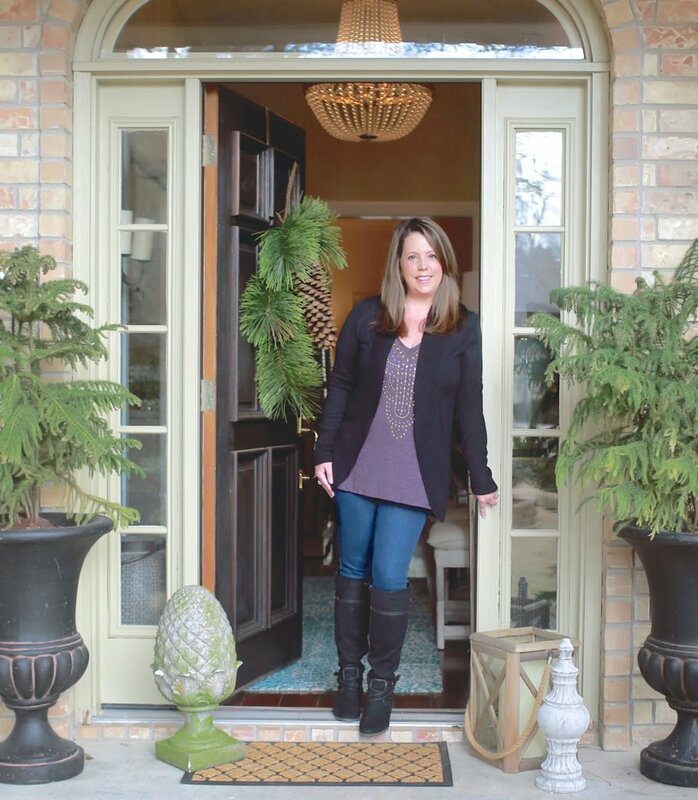 Cyndy has a great tutorial for achieving a paint finish that’s as smooth as butter. The secret is using an extender in the paint. I’ve tried it and it works like magic. I used a small, 4″ roller since my piece was small. I gave the piece two coats of paint and allowed the first coat to dry over night. I should also note that I taped off the brass detail on the end table to avoid getting paint on it. I’m in loooove with the color! You can see more of my guest room makeover here. Hi Angela! I did not sand after I primed. HA, I’ve lost my mind. I did sand it after I primed. There is a typo in the post. It should say “after priming, give the piece another light sanding and wipe down any dust.” I used the same 150 grit paper that I used for the first sanding. Awesome !!! Thank you for posting ! I am painting a dresser white. I was told to use a foam roller for a smooth finish. The roller causes a textured finish. I painted a Home Depot cabinet (laminate or something fake) with primer, then a top coat of paint. I tried to lightly sand at that point, and it took off both the paint and the primer! What to do? It has been damp and rainy-could it be it felt dry but wasn’t? I tried using this primer spray on a piece of furniture and it splattered and left splotches rather than a fine mist. Shook the can frequently, wiped the nozzle, gave it two coats and used an entire can on a small piece. Did you have any difficulty with the spray? I’m not convinced its worth the cost, but it might be user error! Thanks Cyndy! I’ll try another can. (It did sit in the basement for about 2 months.) I really want it to work since it would great for pieces with lots of spindles and fine details!